Why not unwind by treating yourself to a a relaxing massage at our purpose built spa, nestled away in the lush jungle-gardens of Lembeh Resort. Enjoy one of our signature treatments with locally made products and essential oils, the perfect way to end an amazing day of critter diving in Lembeh Strait. The Lembeh Resort Spa is open from 2:15 p.m. to 10:15 p.m. 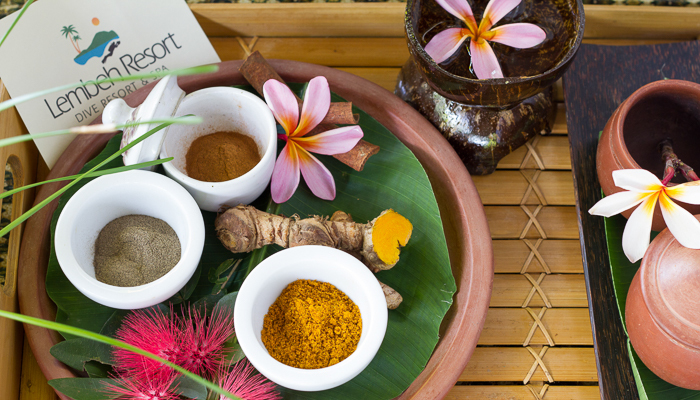 Select from a range of treatments from a 30-minute reflexology session to 2.5 hours of pure pampering. Our complete foot care to soothe your sore feet. Ritual starts with foot wash followed by traditional reflexology, and ends with foot scrub and moisturizer. Indulge your feet with our pure reflexology treatment. An hour of full concentration for your tired feet. Pamper yourself with two therapists doing your treatment simultaneously. Delightful manicure with a hand scrub, shoulder and arm massage. Enjoy a full body massage that will help release tension from your muscles and your mind. Enjoy our sensational body massage followed by a face and head massage. Say goodbye to dull dry skin with our Lembeh Sensational Body Aromatherapy massage together with your choice of body scrub—Javanese ‘Lulur’, Green Tea or Coffee. Lay back and enjoy a deep relaxing massage that will ease away all muscle tension coupling aromatherapy massage with Javanese warm stones. Enjoy a refreshing facial that uses natural ingredients to help your skin look young and glowing.